"On saturday we was going to Blists hill with Chris and Michelle. When they got here i opened some of my birthday presents when it wasn't my birthday yet. Chris said i could open them early and i checked with Mommy, Pauly and Opeie to see if it was Ok. They said yes and i felt very excited. There were two presents, I opened the first one and it was a book about Lego and how to build things. I shouted Pauly to tell him because we had been in Smyths and had been talking about. Were going to build some of the things out of it. I want to try and build some of the pirate things. I opened the second present and I LOVED IT! 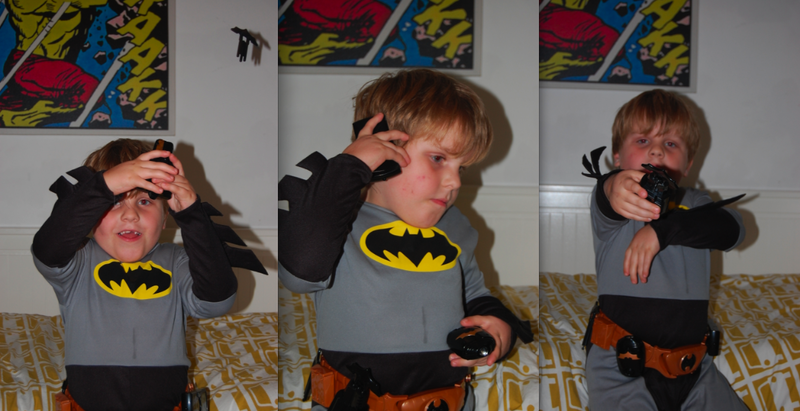 I wanted to play with it straight away but we had to go out, oh yeah it was a Batman utility belt i forgot to say. When we got back from Blists Hill we got it straight out. It is so cool and i like it a lot. There's a mini case and you can put mini Batarangs in it. There is a torch and it shines a Bat symbol, luckily Michelle brought batteries so i could play with it straight away. It's got a grapple hook shooter, me and Chris were trying to shoot it into Pauly's apple pie and custard. Im really happy that Chris and Michelle are my friends and i love my presents. Thank you Chris and Michelle." Well as you can probably tell weve had a pretty excited young super hero on our hands who loves strutting around with his gadgets close to hand. Thanks Chris and Michelle i think you may be invited into the league of heroes very soon. Awesome, I love that its written exactly as Seth has spoken, just makes it so much better. We will certainly try harder to get the grapple hooks in your apple pie and custard next time! do you like the action shot of the grapple hook firing out?